Cyprus Department of Antiquities, Ministry of Transport, Communications and Works announces the completion of the 2018 underwater archaeological mission at the Akrotiri- Dreamer’s Bay ancient port, in the Lemesos District. The survey was directed by staff from the University of Southampton, Centre for Maritime Archaeology, as part of an ongoing collaborative research project on the peninsula since 2015 led by the University of Leicester. 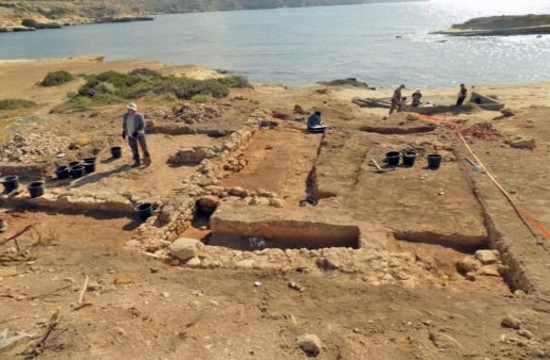 The work was conducted with the permission of the Republic of Cyprus Department of Antiquities and the UK Sovereign Base Areas Administration, and with the support and assistance of RAF Akrotiri, the Defence Infrastructure Organisation and the Western Sovereign Base Area Archaeological Society. Equipment and assistance was also offered from the University of Cyprus, MARELab, the Cyprus University of Technology, CP Marine Explorations, and Kembali Divers. The project was generously funded by the Honor Frost Foundation. The excavation and survey was conducted between 10-24 September 2018 by a team of professional diving maritime archaeologists, students of maritime archaeology, divers, surveyors, and terrestrial archaeologists predominantly from Cyprus and the UK who investigated for over two weeks, the remains of an ancient breakwater submerged some 1-1.5 to 5m below the water in Dreamers Bay. The primary objective was to determine its precise function and date and specifically its relationship with the archaeological remains of Roman/early Byzantine date investigated in previous seasons along the western shores of the bay, as well as the ancient cliff-top quarries, which overlook the waters it protected. The overall aim was to build up a more complete picture of the port as part of the ancient settlement of the Akrotiri Peninsula, within the context of the southern coast of Cyprus and the eastern Mediterranean. The submerged ancient breakwater extends some 120m offshore. The breakwater had been previously been reported by a number of maritime archaeologists and was documented in the 1980s. The objective of this survey was to further define the extent and nature of the ancient harbour and record the detail of its key features using photogrammetry, in order to clarify the method of its original construction and its specific purpose. The survey also examined the breakwater’s northern end in order to determine if it was originally connected to the land as it is now dislocated by some 50m. The photogrammetry was partially successful but limited by the very shallow and turbulent nature of the water over the breakwater although, a comprehensive plan of the southern portion of the feature was achieved and this data is currently being processed. The breakwater was also located in space using RTK DGPS and aspects of its construction were recorded in detail using photography and sketches. It was noted that the feature was three, maximum four courses deep, along the main body of the feature up to c. 120m, and that the southern end of the breakwater was more dislocated and the width in this section more extensive. Also the water to the south of the breakwater was deeper and in response to this the courses of construction were more numerous to compensate for increased water depths. This raised the question as to whether the feature was in fact a breakwater with shelter provided along its length in its lee or in fact a jetty that was primarily accessed via deeper waters to the south which facilitated the offloading of goods and people that were then transported via smaller craft to the shore. Further survey work was also undertaken of the submerged archaeological remains around the breakwater and throughout the entire underwater landscape of Dreamers Bay. All finds were noted, described and photographed underwater and a record of their location taken using GPS. Selected finds were lifted when archaeologists felt they were either in danger of further displacement and erosion on the seafloor or useful as chronological indicators. Distribution and quantities were noted to explore the nature of activities either side of the breakwater in order to help determine its function. Of note in terms of finds, was a large concentration of relatively homogenous ceramics, mostly amphorae, of apparent late Roman date concentrated to the east of the breakwater. This material was very broken up and concreted into the seabed but appears on first evaluation, to be the remains of a very fragmented shipwreck. In addition to a number of stone anchors distributed around the breakwater, three short columns of what appears to be Aswan granite, were also found to the east of the breakwater, two on top of the rubble that fell to the east of the structure, and one in association with the shipwreck. The initial interpretation is that the columns were also part of the cargo of the ship that wrecked against the breakwater after it fell into disuse. During the September 2018 season, a number of sediment cores were also extracted in order to try and determine the nature of the environment either side of the breakwater over the course of its life – sediments deposited in calmer waters indicating that shelter was available, whereas those deposited in more tempestuous seas would indicate that the shelter previously provided by the breakwater was no longer afforded and the area had become exposed to the prevailing maritime conditions. The four cores that were successfully extracted are currently being analysed and assessed for any dating material in the hope that this transition in exposure and hence the date that the breakwater fell out of use, can be determined.